"Ulster-Scots" redirects here. For the dialects of Scots spoken in parts of Ulster, see Ulster Scots dialects. The Ulster Scots (Ulster-Scots: Ulstèr-Scotch), also called Ulster Scots people (Ulstèr-Scotch fowk) or, outside the British Isles, Scots-Irish (Scotch-Airisch), are an ethnic group in Ireland, found mostly in the province of Ulster and to a lesser extent in the rest of Ireland. Their ancestors were mostly Protestant Presbyterians Lowland Scottish migrants, the largest numbers coming from Galloway, Lanarkshire, Renfrewshire, Ayrshire and the Scottish Borders, with others coming from further north in the Scottish Lowlands and, to a much lesser extent, from the Highlands. These Scots migrated to Ireland in large numbers both as a result of the government-sanctioned Plantation of Ulster, a planned process of colonisation which took place under the auspices of James VI of Scotland and I of England on land confiscated from members of the Gaelic nobility of Ireland who fled Ulster, and as part of a larger migration or unplanned wave of settlement. Ulster Scots emigrated onwards from Ireland in significant numbers to what is now the United States and to all corners of the then-worldwide British Empire—what are now Canada, Australia, New Zealand, South Africa, the West Indies, to British India and to a lesser extent to Argentina and Chile. Scotch-Irish (or Scots-Irish) is a traditional term for Ulster Scots who emigrated to North America. Traditional provincial Flag of Ulster. Scottish Saltire (St. Andrew's Cross). Flag of England (St George's Cross). The first major influx of border English and Lowland Scots into Ulster came in the first two decades of the 17th century. First, before the Plantation of Ulster and even before the Flight of the Earls, there was the 1606 independent Scottish settlement in east Down and Antrim. It was led by adventurers James Hamilton and Sir Hugh Montgomery, two Ayrshire lairds. Montgomery was granted half of Conn O'Neill's land as a reward for helping him escape from prison. Hamilton forced himself in on this deal when he discovered it and, after three years of bickering, the final settlement gave Hamilton and Montgomery each one-third of the land. Starting in 1609, Scots began arriving into state-sponsored settlements as part of the Plantation of Ulster. This scheme was intended to confiscate all the lands of the Gaelic Irish nobility in Ulster and to settle the province with Protestant Scottish and English colonists. Under this scheme, a substantial number of Scots were settled, mostly in the south and west of Ulster, on confiscated land. While many of the Scottish planters in Ulster came from southwest Scotland, a large number came from the southeast, including the unstable regions right along the border with England (the Scottish Borders and Northumberland). These groups were from the Borderers or Border Reivers culture, which had familial links on both sides of the Anglo-Scottish border. Contrary to popular misinformation and due mainly to the simplification of Irish history for political agenda purposes, these Reivers were not all Protestants, many if not a majority would have been at least nominally Roman Catholics. The plan was that moving these Borderers to Ireland would both solve the Borders problem and tie down Ulster. This was of particular concern to James VI of Scotland when he became King of England, since he knew Scottish instability could jeopardise his chances of ruling both kingdoms effectively. The Ulster-Scottish population in Ireland was quite possibly[weasel words] preserved from complete annihilation[peacock term] during the subsequent Irish Confederate Wars, when a Scottish Covenanter army was landed in the province to protect the Ulster-Scottish settlers from native Irish landowners. The war itself, part of the Wars of the Three Kingdoms, ended in the 1650s, with the Cromwellian conquest of Ireland. At the head of the army, Oliver Cromwell conquered all of Ireland. Defeating the Irish Confederates and English Royalists on behalf of the English Parliamentarians, he and his forces employed methods and inflicted casualties among the civilian Irish population that have long been commonly considered by contemporary sources, historians and the popular culture to be outside of the accepted military ethics of the day (see more on the debate here). After the Cromwellian war in Ireland was over, many of their soldiers settled permanently in eastern Ulster. Under the Act of Settlement 1652, all Catholic-owned land was confiscated and the British Plantations in Ireland, which had been destroyed by the rebellion of 1641, were restored. However, due to the Scots' enmity to the English Parliament in the final stages of the English Civil War, English settlers rather than Scots were the main beneficiary of this scheme. There was a generation of calm in Ireland until another war broke out in 1689, again due to political conflict closely aligned with ethnic and religious differences. The Williamite war in Ireland (1689–91) was fought between Jacobites who supported the restoration of the Catholic James II to the throne of England and Williamites who supported the Protestant William of Orange. The majority of the Protestant colonists throughout Ireland but particularly in Ulster, fought on the Williamite side in the war against the Jacobites. The fear of a repeat of the massacres of 1641, fear of retribution for religious persecution, as well as their wish to hold on to lands which had been confiscated from Catholic landowners, were all principal motivating factors. The Williamite forces, composed of British, Dutch, Huguenot and Danish armies, as well as troops raised in Ulster, ended Jacobite resistance by 1691, confirming the Protestant minority's monopoly on power in Ireland. Their victories at Derry, the Boyne and Aughrim are still commemorated by the Orange Order into the 21st century. Finally, another major influx of Scots into northern Ireland occurred in the late 1690s, when tens of thousands of people fled a famine in Scotland to come to Ulster. It was only after the 1690s that Scottish settlers and their descendants, the majority of whom were Presbyterian, gained numeric superiority in Ulster, though still a minority in Ireland as a whole. Along with Catholics, they were legally disadvantaged by the Penal Laws, which gave full rights only to members of the Church of Ireland (the Anglican state church), who were mainly Anglo-Irish (themselves often absentee landlords), native Irish converts or the descendants of English settlers. For this reason, up until the 19th century, there was considerable disharmony between Dissenters and the ruling Protestant Ascendancy in Ireland. With the enforcement of Queen Anne's 1703 Test Act, which caused further discrimination against all who did not participate in the established church, considerable numbers of Ulster-Scots migrated to the colonies in British America throughout the 18th and 19th centuries. In fact, these 'Scots-Irish' from Ulster and Lowland Scotland comprised the most numerous group of immigrants from Great Britain and Ireland to the American colonies in the years prior the American Revolution, with an estimated 150,000 leaving northern Ireland at the time. Towards the end of the 18th century, many Ulster-Scots Presbyterians ignored religious differences and, along with many Catholic Gaelic Irish, joined the United Irishmen to participate in the Irish Rebellion of 1798 in support of republican and egalitarian ideals. 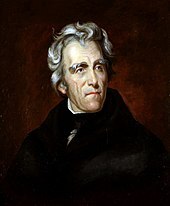 Andrew Jackson, seventh President of the United States, was the first of Scots-Irish extraction. Just a few generations after arriving in Ulster, considerable numbers of Ulster-Scots emigrated to the North American colonies of Great Britain. Between 1717 and 1775, an estimated 200,000 migrated to what became the United States of America. Around the same time, the British took control of the territory of New France, allowing many Ulster-Scots to migrate to these areas as well. These people are known as the Scotch-Irish Canadians. In the United States Census of 2000, 4.3 million Americans (1.5% of the population of the United States) claimed Scotch-Irish ancestry. Author and former United States Senator Jim Webb suggests that the true number of people with some Scots-Irish heritage in the United States is more—over 27 million—possibly because contemporary Americans with some Scotch-Irish heritage may regard themselves as either Irish, Scottish, or simply American instead. Over the centuries, Ulster Scots culture has contributed to the unique character of the counties in Northern Ireland. The Ulster Scots Agency points to industry, language, music, sport, religion and myriad traditions brought to Ulster from the Scottish lowlands. In particular, the origin of country and Western music was extensively from Ulster Scots folk music, in addition to English, German, and African-American styles. The cultural traditions and aspects of this culture including its links to country music are articulated in David Hackett Fischer's book, Albion's Seed: Four British Folkways in America. In 2010's documentary The Hamely Tongue, filmmaker Deaglán O Mocháin traces back the origins of this culture and language, and relates its manifestations in today's Ireland. The film's title refers to James Fenton's book, The Hamely Tongue: A personal record of Ulster-Scots in County Antrim. Most Ulster Scots speak Ulster English as a first language. Ulster Scots is the local dialect of the Lowland Scots language which has, since the 1980s, also been called "Ullans", a portmanteau neologism popularised by the physician, amateur historian and politician Dr Ian Adamson, merging Ulster and Lallans—the Scots for "Lowlands" —but also an acronym for "Ulster-Scots language in literature and native speech". The North American ancestry of the X-linked form of the genetic disease congenital nephrogenic diabetes insipidus has been traced to Ulster Scots who came to Nova Scotia in 1761 on the ship Hopewell. ^ "Selected Social Characteristics in the United States (DP02): 2017 American Community Survey 1-Year Estimates". U.S. Census Bureau. Retrieved 14 October 2018. ^ Born Fighting: How the Scots-Irish Shaped America. New York: Broadway Books. 2004. ISBN 0-7679-1688-3. More than 27 million Americans today can trace their lineage to the Scots, whose bloodline was stained by centuries of continuous warfare along the border between England and Scotland, and later in the bitter settlements of England's Ulster Plantation in Northern Ireland. ^ Webb, James (23 October 2004). "Secret GOP Weapon: The Scots Irish Vote". The Wall Street Journal. Retrieved 7 September 2008. ^ "Census 2011: Religion: KS211NI (administrative geographies)". nisra.gov.uk. Retrieved 11 December 2012. ^ "8. Religion" (PDF). Central Statistics Office. Retrieved 30 October 2018. ^ "Tha Boord o Leid An Acoont o tha Darg for the year hinmaist 31 Decemmer 2001" (PDF). North/South Language Body. Retrieved 22 May 2017. ^ "Ulstèr-Scotch an Scotch-Airisch Leid an Fowkgates". NIPR. Retrieved 29 June 2017. ^ "Pauline Frommer's Ireland". google.ie. ^ Emerson, Newton (20 May 2004). "Ulster blood, English heart – I am what I am". Newshound. Retrieved 31 December 2018. ^ "Greencastle Museum" (PDF). greencastlemuseum.org. ^ "'Sheep stealers from the north of England': the Riding Clans in Ulster by Robert Bell". 24 January 2013. ^ a b David Hackett Fischer, Albion's Seed: Four British Folkways in America, New York: Oxford University Press, 1989, pp. 608–11. ^ Patrick Macrory, The Siege of Derry, Oxford University Press, 1980, pp. 97–98. ^ Jane Kenyon, Jane Ohlmeyer, The Civil Wars: A Military History of England, Scotland and Ireland 1638–1660, p. 74. ^ "Irish Rebellion | Caldwell Genealogy". caldwellgenealogy.com. Retrieved 27 August 2016. ^ The Rebellion of 1641, R. Barry O'Brien. From The Irish Ecclesiastical Record, 4th Series, Vol. XVII, No. 449, May 1905. ^ Nicholas Canny, Making Ireland British, p. 562. ^ "AOL UK - Search". aol.co.uk. ^ Fischer, David Hackett, Albion's Seed: Four British Folkways in America Oxford University Press, USA (14 March 1989), p. 606; Parke S. Rouse, Jr., The Great Wagon Road, Dietz Press, 2004, p. 32, and Leyburn, James G., The Scotch-Irish: A Social History, Univ of NC Press, 1962, p. 180. ^ Why You Need To Know The Scotch-Irish. ^ James H Webb. "Born Fighting: How the Scots-Irish Shaped America". powells.com. ^ Falconer G. (2006) The Scots Tradition in Ulster, Scottish studies review, Vol. 7, Nº 2. p. 97. ^ Hickey R. (2004) A Sound Atlas of Irish English. Walter de Gruyter. p. 156. ^ Tymoczko M. & Ireland C.A. (2003). Language and Tradition in Ireland: Continuities and Displacements, Univ. of Massachusetts Press. p. 159. ^ Bichet et al, X-linked nephrogenic diabetes insipidus mutations in North America and the Hopewell hypothesis, J Clin Invest. 1993 September; 92(3): 1262–1268. doi:10.1172/JCI116698 Unité de Recherche Clinique, Hôpital du Sacré-Cœur de Montréal, Montréal, Québec, Canada.